Personalized Floral Address Plaque - - oval house number sign with floral border holds up to five 3" numbers. Frame comes in sixteen different colors. Solid cast aluminum frame is powder-coated to withstand the elements. White ceramic plaque comes with your choice of polished brass or stainless steel self-adhesive numbers. Frame colors: black, burgundy, champagne, smooth glossy black, evergreen, textured beige, gunmetal, mocha, white, oil rubbed bronze, brushed aluminum, hand rubbed bronze, frosted umber, verde green (small image on right), copper (small image on left), swedish silver (main image). The numbers you order are in the box, but you need to attach the numbers to the sign. Numbers come with outdoor-grade, petroleum-based, double-sided adhesive for easy installation. This oval address sign matches our Floral Curbside Mailboxes (see Related Products). 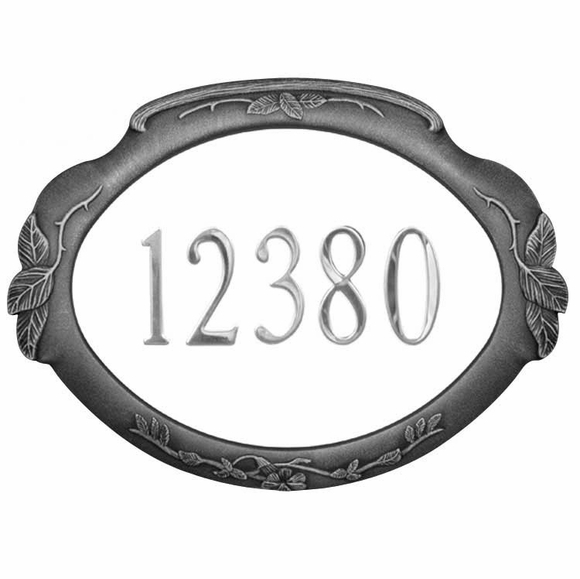 Personalized oval address sign with 3" numbers.